Your deltoid ligament is also known as the medial ligament. It is essentially a band that connects your lower leg bone to the inner part of your ankle. This ligament is triangular in shape and helps to support your ankle. It also prevents it from over rotating to the outer side of your body. This ligament is made from superficial and deep fibers. It is considered on of the strongest skeletal structures in your entire body. Because this ligament is so strong and extremely important for your ankle’s anatomy, a deltoid ligament can be debilitating. Luckily, the strength and structure of your ankle makes this type of sprain quite rare. 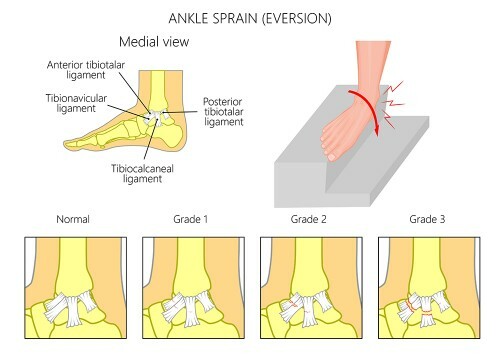 When you do sprain it, it is often because you overexerted the ligament that connects your fibula to your heel bone. When you develop a sprain or deltoid ligament sprain, it is generally from a severe trauma that caused your ankle to twist outward. Often, you will develop a broken fibula at the same time. This is not a particularly common injury, and it will generally only occur when there is a severe trauma that causes the ankle to twist outward. Other than severe trauma and acute injuries, a deltoid ligament tear can occur when you have excessive wear and tear or overuse of this ligament. Your ligament is designed to support your foot’s arches, so people who have flat feet or are knock-need tend to have this kind of injury more often. The most common symptoms of a deltoid ligament tear is bruising, swelling and pain that radiates outward from your inner ankle. How severe your symptoms are depends entirely on how severe the injury is. If you think that you could have a deltoid ligament tear, it is important to go to your doctor to be checked out. Your doctor will most likely take x-ray images to see if there are abnormalities in the ankle or foot’s bones. It will also look for avulsion of bone where the injury is. An MRI may also be done to check the soft tissues and determine how severe the deltoid ligament tear is. Grade I Injury: This type of tear comes from stretching the ligament too much. It will generally occur with just minor symptoms. While your ankle may cause you pain, you can still put some weight on your foot. Grade II Injury: This is when you have a partial deltoid ligament tear. Because of this, it will have more pain than a standard Grade I injury. You are completely unable to bear any weight on the affected foot. Grade III Injury: This is the term used when your deltoid ligament is completely torn. In many cases, your doctor will tell you to rest and avoid walking. They will also recommend applying ice. In very severe cases, you may need to have surgery to repair the ligament. In many cases, a deltoid ligament tear can be treated with rest, ice or medical care. Only severe cases require surgery. Other patients only need elevation of the leg, ice application and rest. To help with the pain, the doctor may recommend non-steroidal, anti-inflammatory drugs (NSAIDs). Unlike outer ligament ankle sprains, this type of tear will generally take a bit longer to heal. Depending on how badly you hurt the deltoid ligament, it can take up to four months for you to recover completely. Some patients will need to use a fracture walker for 3 to 12 weeks. RICE is an acronym for a type of medical treatment. It stands for the following treatment: Rest, Ice, Compression and Elevation. Rest: Rest your ankle as much as possible. Avoid walking or weight-bearing activities. You may need to use crutches to take weight off of your ankle. Ice: Use ice packs on your ankle to reduce swelling. A bag of frozen pees also works. You do not want to fall asleep while doing this because the ice could cause frostbite. Use the ice for 10 minutes at a time, and you can repeat this step several times a day. Compression: An elastic bandage can be used to compress the ankle. Do not wrap your ankle too tightly because it could reduce your blood circulation and slow healing. Elevation: To help with healing and lower swelling, elevate your affected ankle. Bring the ankle above your heart by lying on your bed with several pillows under your ankle. If you have to go to work, use a chair or stool to elevate the affected ankle. When your inflammation and swelling have healed, physical therapy can help you finish recovering. Physical therapy generally starts a few weeks or months after your injury. It focuses on strengthening and stretching the ligament gently. A brace can help boost your ankle stability. It can also strengthen and tighten your ligaments. In severe cases, a surgical intervention may be necessary if the ligament remains weak and does not improve over time. The surgery may involved re-attaching or tightening the ligaments to the bone. The damaged ligament could also be replaced with a tendon from somewhere nearby. Once the surgery is done, a cast is applied for six weeks. Then, you have to wear an ankle brace for six weeks. Physiotherapy may be used to help boost the ankle’s mobility or strength. At three months, you can start doing light exercises. You cannot do any active sports that require twisting like rugby, running or football until six months after the surgery.